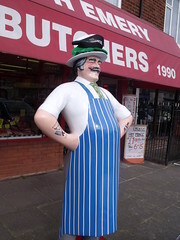 Another difference between my line of butchers and the Balsons: while they have been in Bridport throughout their long history, my ancestors moved regularly, running shops in Hutton Rudby (Yorkshire), Middlesbrough, Sunderland, Seaham (County Durham), Gateshead, Wallsend, Whitley Bay, and possibly elsewhere, and branched out into the dairy business and into running licensed premises. © Copyright Elliott Brown and licensed for reuse under this Creative Commons Licence. The Stainthorps of Hutton Rudby were also farmers, again since at least the late 17th century,1 owning between 15 and 22 acres of land at Enterpen and North End.4,5 They will have slaughtered their own livestock and sold the meat locally and at nearby Stokesley market. “…the butchers’ refuse was dumped in the Blood Midden – the ponds off Green Lane to the west of Campion Lane. The smell was dreadful, especially when the farmer spread the rotted waste as muck, but it was a very popular place to go ratting, as the rats there grew “as big as terriers”. 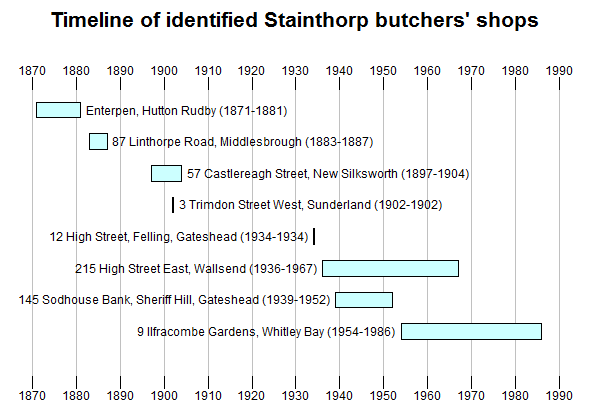 One of these 19th-century butchers was my three-greats grandfather Charles Stainthorp. By 1883, Charles and his son William had a butcher’s shop at 87 Linthorpe Road, Middlesbrough.15 This building still exists, and in 2016 was occupied by a branch of the electronic goods retailer, Maplin. The Stainthorp family farm was sold, and Charles and William Stainthorp both left Hutton Rudby for good. There were no Stainthorps left in Hutton by the end of the nineteenth century. The building would have looked significantly different in William Stainthorp’s day, with an additional top floor demolished after 1961. 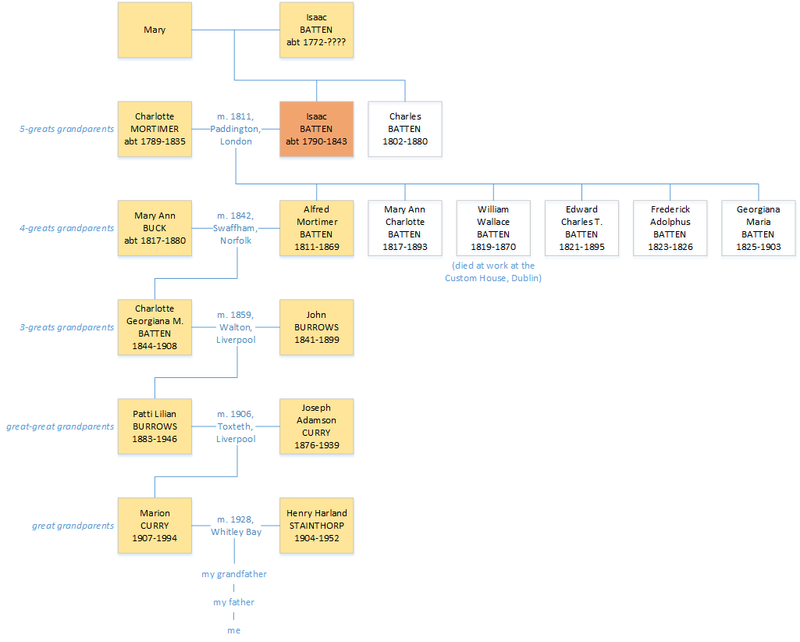 In 1895, William, Margaret and their five children embarked on their next major move. 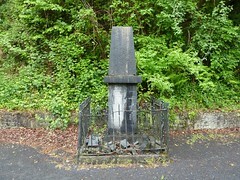 (A sixth child, named William Harland Stainthorp after his maternal grandfather, had died aged 13 months of measles and is buried in Skelton cemetery. )27 By the end of that year the family were in Hartlepool;28 almost immediately they moved again, northwards to the area of Tunstall/New Silksworth, near Sunderland. (With all the chaos of these multiple moves, they neglected to register the birth of their youngest child.) Nowadays New Silksworth is part of the built-up metropolitan area of Sunderland. When my ancestors moved there it was a small colliery village of newly-built miners’ houses, surrounded by open fields. Between 1897-1904, the Stainthorps lived at 57 Castlereagh Street, New Silksworth, Tunstall. Margaret and William’s last three children were born there, including the youngest of all, my great grandfather, Henry Harland Stainthorp (1904-1952).25 57 Castlereagh Street is at the corner of two streets and is currently a shop – in 2016, Devito’s pizza takeaway; before that a BMX bike shop – so it may well have been the location of William’s butcher’s shop in the early 1900s. William died of a stroke at his home in Whitley Bay on 4 March 1924. 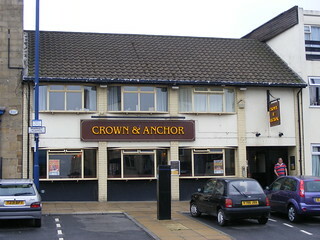 His widow Margaret died fourteen years later at the Gladstone Hotel, Scotswood Road, Newcastle upon Tyne:7 I don’t know whether she was there merely as a customer or as the mother/mother-in-law of the licensee. The second child and eldest son of Margaret and William, before the war I believe Frank ran his own butcher’s shop in Seaham, although I have not been able to find the exact location. As an aside, what happened to Frank Stainthorp’s widow and two children after WWI is still one of the major mysteries in my family history research. By 1939 Charles was living and operating out of a shop at 145 Sodhouse Bank, Sheriff Hill, Gateshead, supported by his three children: Sidney, Frank and Verita. After Charles’ death in 1945, his middle son Frank Stainthorp (1916-1975) took over the shop in Sheriff Hill. they’re good for your belly and your chest. they’ll cure your sweaty feet! This shop at 145 Sodhouse Bank is the earliest Stainthorp butcher’s that I have a photo of. I am extremely grateful to two of my relatives who both sent me copies of this photograph. It was probably taken after 1945. The man in the door in the white butcher’s apron is Charles Stainthorp’s son Frank. Sheriff Hill, Gateshead, after 1945? My great-great uncles Frank and Charles Stainthorp had three younger brothers: William Harland Stainthorp, mentioned above, who died in infancy; another William Stainthorp (1901-1919) who died aged 17 of a kidney infection;7 and finally the youngest of the nine siblings – my great grandfather Henry Harland Stainthorp, known as Harry. 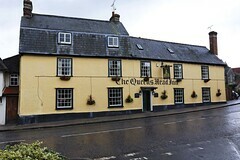 He was named after his uncle Henry Harland, another publican. From at least 1936 until his sudden death in 1952 (at just 48 years old),7 Harry Stainthorp had a shop at 215 High Street East, Wallsend, directly opposite Wallsend Town Hall.39,40 I am sure that a photograph of this shop must exist somewhere – perhaps in North Shields library’s collection of 50,000 local images. The Wallsend shop is just off the right-hand edge of this commercially-available photograph. When I passed the location of the shop on the High Street in 2015, the building was empty and shuttered. which belonged to my grandfather. While knittin’ scarves to warm the soldiers’ throats. Whose job’s to make the butchers burn their boats. To buy some meat without her ration books. And another scalp is added to her belt. When his father Harry Stainthorp died unexpectedly in 1952, my grandad Bill Stainthorp gave up his job as a bank clerk with Lloyd’s Bank and his expected future career, to take over the family business.34,42 He was joined in this at first by his brother Robin (1937-2007), who later went into the insurance industry. A third brother, Norman (1944-2006) emigrated to New South Wales in the 1970s. W. Stainthorp, butcher, Ilfracombe Gardens, Whitley Bay, about 1985. I can remember visiting my grandad’s shop as a child – I have a clear mental picture of the layout of the shop, the cold room up a couple of steps, and a small yard out the back. For some reason certain details have particularly stuck in my mind – the smell of the shop, sawdust on the floor, my grandad’s collection of pottery pig ornaments in the window, and containers full of tripe and pease pudding (“Geordie hummus”!) in the display cabinet. Created using RootsMagic software. I have not been able to find the addresses of any shops between 1904 and about 1934. Paul Harland Stainthorp (paul@paulstainthorp.com). Version 1.5, updated 18 September 2016. Exchequer Court of York, will and probate, Francis Stainthorpe (d. before 1 May 1693), Potto, Cleveland; Borthwick Institute for Archives, York. All Saints’ Church (Rudby, Yorkshire, England), parish registers; digital images, Findmypast (http://www.findmypast.co.uk/ : accessed 2 August 2016). Barrigan, Alice. ‘Epilogue.’ In: Remarkable, but still true: the story of the Revd R.J. Barlow and Hutton Rudby in the time of cholera. Guisborough: Westgate, 2007; HTML version, North Yorkshire History. http://northyorkshirehistory.blogspot.co.uk/ (accessed 15 October 2014). “1871 England Census,” digital images, Ancestry Library Edition (http://www.ancestrylibrary.com/ : accessed 18 December 2015); The National Archives, Kew. “1881 England Census,” digital images, Ancestry Library Edition (http://www.ancestrylibrary.com/ : accessed 18 December 2015); The National Archives, Kew. Barrigan, Alice. A History Walk round Hutton Rudby. Hutton Rudby History Society, 1997; HTML version, North Yorkshire History. http://northyorkshirehistory.blogspot.co.uk/ (accessed 9 September 2016). “1841 England Census,” digital images, Ancestry Library Edition (http://www.ancestrylibrary.com/ : accessed 18 December 2015); The National Archives, Kew. The York Herald, 4 April 1889, p. 3. The York Herald, 29 July 1871, p. 9. The Northern Echo [Darlington], 6 June 1881, p. 4. The Daily Gazette [Middlesbrough], 17 June 1879, p. 4. The York Herald, 4 January 1868, p. 5. The North-Eastern Daily Gazette [Middlesbrough], 22 December 1883, p. 2. The North-Eastern Daily Gazette [Middlesbrough], 6 July 1888. The North-Eastern Daily Gazette [Middlesbrough], 3 April 1889. The York Herald, 11 April 1889, p. 3. “1891 England Census,” digital images, Ancestry Library Edition (http://www.ancestrylibrary.com/ : accessed 18 December 2015); The National Archives, Kew. “1901 England Census,” digital images, Ancestry Library Edition (http://www.ancestrylibrary.com/ : accessed 18 December 2015); The National Archives, Kew. “1911 England Census,” digital images, Ancestry Library Edition (http://www.ancestrylibrary.com/ : accessed 18 December 2015); The National Archives, Kew. “1939 Register,” digital images, Findmypast (http://www.findmypast.co.uk/1939register : accessed 3 March 2016); The National Archives, Kew. Newcastle Journal and North Mail, 23 September 1940, p. 2. England and Wales, birth certificate (certified copy); General Register Office, Southport. The Yorkshire Herald [York], 25 August 1892, p. 3. Register of burials in the burial ground of Skelton; digital images, Deceasedonline (https://www.deceasedonline.com/: accessed 8 ‎June ‎2016), 1893, p. 143; Redcar and Cleveland Borough Council. “National School Admission Registers & Log-Books 1870-1914,” digital images, Findmypast (http://www.findmypast.co.uk/ : accessed 5 October 2015). Sunderland Daily Echo, 4 March 1901, p. 5. Sunderland Daily Echo, 27 October 1904, p. 2. “UK, City and County Directories, 1766 – 1946,” digital images, Ancestry Library Edition (http://www.ancestrylibrary.com/ : accessed 6 June 2015), Kelly’s Directory of Durham, 1902. “Historical Directories of England & Wales,” digital images, University of Leicester Special Collections Online (http://specialcollections.le.ac.uk/ : accessed 13 September 2016), Ward’s Directory of Newcastle-on-Tyne, 1916. “UK, City and County Directories, 1766 – 1946,” digital images, Ancestry Library Edition (http://www.ancestrylibrary.com/ : accessed 6 June 2015), Kelly’s Directory of Northumberland, 1921. Commonwealth War Graves Commission, “Find War Dead,” digital images, CWGC (http://www.cwgc.org/find-war-dead/ : accessed 1 April 2015). The Courier [Chesterfield], 5 June 1915, p. 6. “British Army WWI Service Records, 1914-1920,” digital images, Ancestry Library Edition (http://www.ancestrylibrary.com/ : accessed 11 March 2015); The National Archives, Kew. ‘Felling High Street,’ History of The Felling..in bite size bits, 9 May 2014. http://the-felling.blogspot.co.uk/ (accessed 14 September 2016). “British Phone Books, 1880-1984,” digital images, Ancestry Library Edition (http://www.ancestrylibrary.com/ : accessed 12 May 2015); BT Archives. “UK, City and County Directories, 1766 – 1946,” digital images, Ancestry Library Edition (http://www.ancestrylibrary.com/ : accessed 6 June 2015), Ward’s Directory of Whitley Bay, Tynemouth, North and South Shields, Jarrow, Wallsend, Newcastle… [etc. ], 1936. Evening Chronicle [Newcastle upon Tyne], 9 May 1940, p. 4. 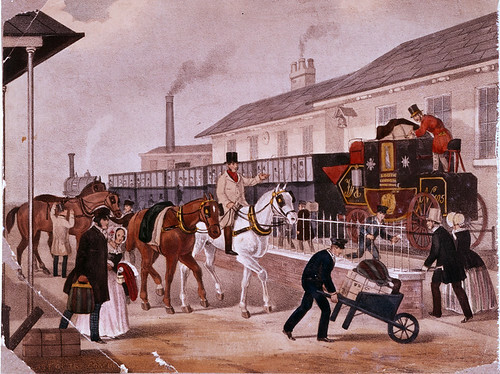 “Find a will: Wills and Probate 1858 – 1996,” digital images, Gov.UK (https://probatesearch.service.gov.uk/#calendar : accessed 1 July 2015); National Probate Calendar. “Potted meat alleged to be ‘brawn’,” British Food Journal, vol. 77, issue 2 (March/April 1975), online archives, Emerald Insight (https://www.emeraldinsight.com/ : accessed 23 October 2014), p. 62.